It's been a busy day at the market in downtown Volos. Angeliki Ioanitou has sold a decent quantity of olive oil and soap, while her friend Maria has done good business with her fresh pies. But not a single euro has changed hands – none of the customers on this drizzly Saturday morning has bothered carrying money at all. For many, browsing through the racks of second-hand clothes, electrical appliances and homemade jams, the need to survive means money has been usurped. "It's all about exchange and solidarity, helping one another out in these very hard times," enthused Ioanitou, her hair tucked under a floppy felt cap. "You could say a lot of us have dreams of a utopia without the euro." 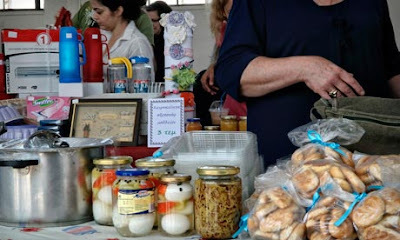 In this bustling port city at the foot of Mount Pelion, in the heart ofGreece's most fertile plain, locals have come up with a novel way of dealing with austerity – adopting their own alternative currency, known as the Tem. As the country struggles with its worst crisis in modern times, with Greeks losing up to 40% of their disposable income as a result of policies imposed in exchange for international aid, the system has been a huge success. Organisers say some 1,300 people have signed up to the informal bartering network. But Volos, the first to be established, is by far the biggest. Until recently the city, 200 miles north of Athens, was a thriving industrial hub with a port whose ferries not only connected the mainland to nearby islands but before Syria's descent into civil war was a trading route between Greece and the Middle East. Once famous for its tobacco, Volos was home to flour mills and cement factories, steel and metal works. But, today, it is joblessness that it has come to be known for in a country whose unemployment rate recently hit a European record of 26%, surpassing even that of Spain. "Frankly the Tem has been a life-saver," said Christina Koutsieri, clutching DVDs and a bag of food as she emerged from the marketplace. "In March I had to close the grocery store I had kept going for 27 years because I just couldn't afford all the new taxes and bills. Everyone I know has lost their jobs. It's tragic." Last year, the Greek government stepped in with a law that supported finding creative ways to cope with the crisis. For the first time, alternative forms of entrepreneurship and local development were actively encouraged. Although locals insist the Tem, which is also available in voucher form, will never replace banknotes – and has not been dreamed up to dodge taxes – they say it is a viable alternative. For local officials such as Panos Skotiniotis, the mayor of Volos, the alternative currency has proved to be an excellent way of supplementing the euro. "We are all for supporting alternatives that help alleviate the crisis's economic and social consequences," he said. "It won't ever replace the euro but it is really helping weaker members of our society. In all the social and cultural activities of the municipality, we are encouraging the Tem to be used."